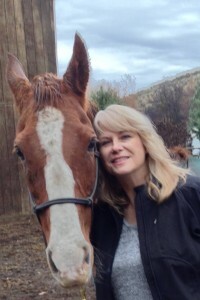 After I turned 50, two kids grown and on their own I was hoping to adopt a horse but never thought I could as they are expensive and my riding experience was limited. I only rode as a kid on a neighbor's horse and at camp. I have worked with many rescues and realized there was a whole lot more to care than just riding. I started volunteering for RCER to spend time with horses and brush them. That is where I met "My Chance." The first time I saw him I was in love. Here is this big, beautiful saddlebred with perfect markings; a white face and four white socks. That wasn't what I fell in love with. I fell in love with him. A 17 yr old senior, who had been professionally trained and competing in shows. How could someone throw him away because he was old? I had to have him. I would go out to his foster home on a regular basis to spend time with him and groom him. Several adoption applications came in on him and he was suppose to be adopted a couple times. After hearing the news that he was going to get adopted I would drive home crying to my husband. He finally said figure out a place to board him and you can get him. I was ECSTATIC! Chance's foster home agreed to let me board him there until I found a permanent home for him. I was serious about learning how to care for a horse. I hired Taylor Gordon from Diamond T Ranch to help train Chance and me. He was a great trainer and I learned a lot. My foster home at Judy's opened up more learning opportunities from Diedra, Vada & Judy from RCER. We since have moved to Western WA and we specifically bought a home where "My Chance" will have a forever home. He has taught patience, kindness and has been my therapist through both my parents dying. He is "My Chance" to have a happy life in my older years and we will grow old together. Much gratitude to Judy and RCER as they have become friends for life.